Wednesday July 27th. Up the mast. This was a photo shoot opportunity. 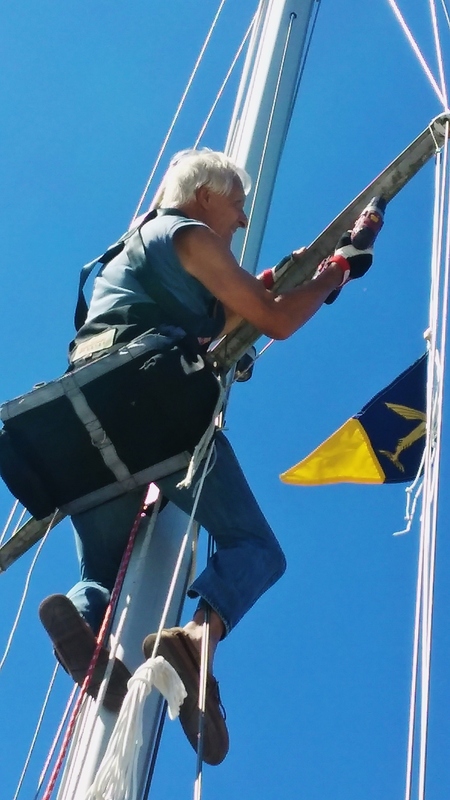 Yesterday I went up the mast with a mountain climbing type rappelling gear to drill holes in the spreaders for the pulley blocks for the flag/burgee halyards and to remove an obsolete try-sail track. 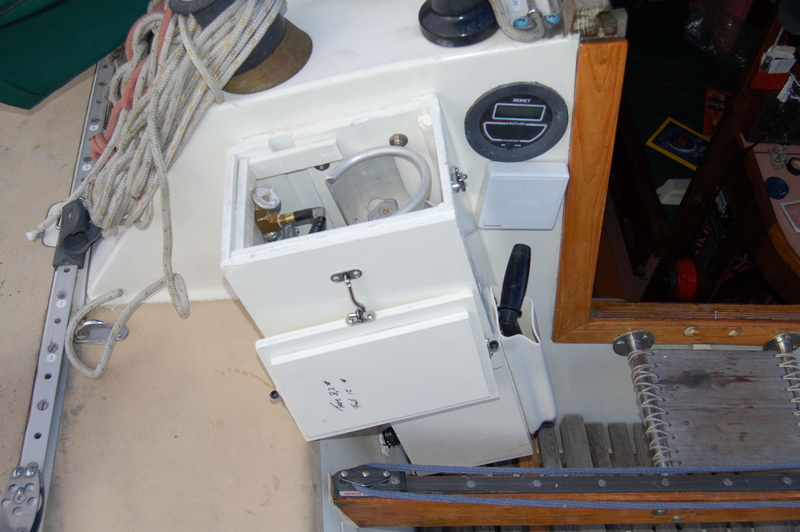 Tomorrow I’ll use the same gear to go up the mast to check the mast steaming light, above the first spreaders. Yesterday I was cranked to the top of the mast by Steve Essig (http://www.essigphoto.com/) the camera man for a team effort documentary led by Dennis Minor (https://vimeo.com/dennisminor). I replaced the old incandescent bulbs with LED lights on the masthead tri-color/anchor light. 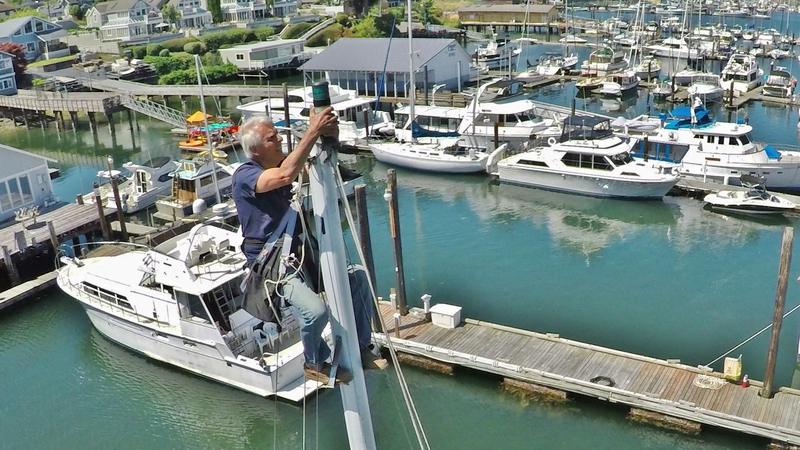 The below clip is part of the video taken by Richard Gillette of RKG Media LLC of Gig Harbor with his drone. Saturday July 23rd. Progress report. September 12 departure from Port Townsend is quickly approaching. But I am making progress. The “to do” list is shrinking and so are my “Shopping List” and my savings. Please, take a look at what is left to scrounge or purchase. The choices on the navigation and communication hard- and software have been made. My youngest son Seth, who is an ace in electronics, came up from Portland to help me install the Vesper AIS transponder. This is an amazing simple system to watch for traffic. I am now cooking on a two burner propane stove instead of the one burner with the small camping stove canisters. The below photo shows the enclosure I made for the 5 gallon aluminum propane tank. 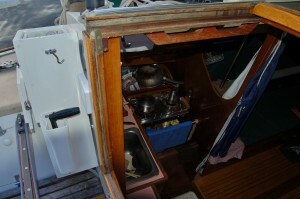 This tank is half the size of the 10 gallon steel tanks I carried on the old “Fleetwood”. But I shall no longer make the long ocean crossings. The new regulations required me to enclose the tank and the anticipated one day project extended into a much bigger undertaking. Measure twice and cut once could have saved me precious hours. But in the end I managed with the half sheet of 1/2″ 4 x 8′ BC DougFir plywood. This coming Saturday, July 30, at 6.30 pm., I will give a presentation and book signing of my SoloMan adventure at the Lummi Island Library. Walk on the 6.10 pm ferry from Goose Berry Point or anchor to the south of the ferry landing and walk up to the library above the ferry landing. I may try to sail up myself. Tuesday September 6th. at 6 pm. is my official farewell party here at the net shed of the Arabella’s Landing Marina in Gig Harbor. We’ll have tacos and refreshments on the deck. I’ll sail up to Port Townsend on Wednesday. Wooden Boat Festival: September 8th through 11th. I give a presentation on the traditional Dutch shallow draft sailing barges on Friday the 8th at 2.30 p.m. and Saturday at 3.45 pm on my SoloMan adventure. During the weekend I will have a spot in the Authors tent where I will be selling and signing “The Mastmakers’ Daughters” and SoloMan”. After the Saturday presentation there will be another farewell party with my daughters and family and friends on the beach before my Monday, or possibly Sunday departure down the Pacific Coast. In an upcoming blog I will have a link on this web site to show my track updated on a 10 minute interval through the De Lorme Reach software. The San Francisco St. Francis YC has me on the schedule for a dinner presentation on Thursday October 6th. I plan to make just a few stops in Oregon and Northern California and then spend time in the San Francisco Bay area in late September early October before heading into Mexico in November, with stops in Santa Barbara, Redondo Beach and San Diego. A favor, please: I have asked this before, so far I have received one review on “SoloMan”. This will boost my sales, as it does on the reviews a number of you wrote for The Mastmakers’ Daughters. I need the money for my depleted cruising kitty. Can you write something on the Amazon review section? Ook heel graag voor de Nederlandse uitgave.